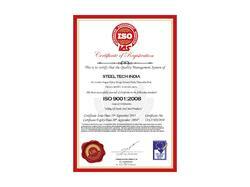 Steel Tech India was incorporated in the year 2011 as a sole proprietorship, ISO Certified and CRISIL rated firm at Chennai, Tamil Nadu (India). Steel Tech India is promoted by a group of experienced entrepreneurs and professionals and veterans from steel industry who after recognizing the growing demand of steel at a rapid pace considering the industrialization and infrastructural development throughout India. We are engaged in Trading and Supplying of Steel Coils, Sheets and Industrial Steel Products. We use steel products like CR.Coil, Hot Rolled Coil, Galvanized Coil, Angles & Chanels, Pipe & Tubes, Bright Bar, Flat Bar, Roofing Sheets, Turbo Air Ventilators, and Stainless Steel. These products are admired for high tensile strength, anti-corrosive finish, durability and ductility. Our company lays great emphasis on the quality of products offered. Thus, we have chosen industry's leading steel product manufacturers as our vendors. Further, we believe that the trust of a client can only be gained by providing him/her the right products at the right time. In this regard, we store our products in bulk quantities at our sound and spacious warehouse to facilitate prompt delivery schedules. We have been fortunate enough in having the support of Mr. V. S. Sathyanarayanan, who he is Technically Qualified with MBA has always directed us on the path to success and recognition in the market. His wealth of 27 years Steel Plant experience in the domain enables him to take effective decisions proving things beneficial for the organization in a long run. Our sound manufacturing and trade practice helps us to achieve the organizational goals and objectives both productively as well as profitably. Without the professional assistance of our skilled employees, our trade practices would not have been executed so well. Our team members delicately and devotedly follow and implement set industrial standards in order to meet highest level of client satisfaction. Furthermore, these professionals are trained as and when the need arises as per the latest market developments. Training sessions not only familiarizes our professionals with latest trends, but also allows them to serve the clients in the best possible manner. Our product range is sourced from authentic vendors of the industry, who follow stringent quality norms and measures. The procured range of products is re-tested on various quality parameters at our end by sincere quality heads. After quality examination, the products are safely stored at our warehousing facility by our trained storekeepers. Apart from warehousing, we have developed proper inventory records to maintain accountability of incoming and outgoing consignments. With a distribution channel spread far and wide, we are able to keep our promise of timely delivery at clients location. We are looking for inquiries from South India including AP, Karnataka, Kerala and Tamil Nadu and cities like Bangalore, Chennai and Hyderabad. Trading, Importer & Exporter of Industrial Steel Products. Since our Quality Inception, we have focused on the quality of our steel products as per our customer requirements and with the Industrial standards. We procure our entire product range from the trustworthy vendors, who have gained high credibility due to their quality assured products. Moreover, we have also hired quality controllers for special requirements, If any., who rigorously check the quality of our each product in our well equipped facility on various well defined quality parameters in order to ensure flawless quality and reliability. We are toiling under the astute guidance of our Chief Executive, who possesses sharp business acumen and in-depth trading expertise. We have recruited self-driven professionals, who ensure that clients requirements are met with quality products in the shortest possible time frame. Our efficient inventory planning reduces the procurement stress of clients, thereby assuring unconstrained delivery at client''s end. Owing to the streamlined efforts and diligence of team members, we have gained trading expertise in the domain. We have been able to generate a huge vendor base for ourselves in the market. Our associations with the leading manufacturers of the industry are based on trust, commitment and mutual understanding that we have generated till date. Vendors associated with us manufacture our range using high grade raw materials following advanced procedures and latest techniques. Long term and cordial relations with these vendors have helped us serve our clients effectively and without delays. We trade and supply a wide range of Industrial Steel Products, Pipes & Tubes and Steel Coils/Sheets. Our rich manpower resources and foolproof strategies ensure that the client requirements are met in the best possible manner. Besides, we keep updating our infrastructural resources as per the organizational needs.